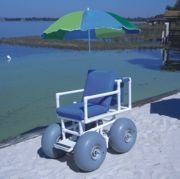 These sturdy, lightweight, all-terrain chairs allow for easier access in sand, snow and other soft soils. The unit comes standard with single motion park brakes, safety belt, umbrella, storage bag and comfortable cushion seat. The chair quickly disassembles into two pieces for easy transport. Weight capacity is 250 pounds. Different versions are available. Monotec 370 is a 100 percent round monofilament yarn shadecloth engineered for shade structures and sails without any re-tensioning. Made in Australia with only monofilament yarn (no tape yarns), Monotec will not stretch or elongate like other popular shadecloth. It is FR treated to pass NFPA-701 and California Title 19 and has a 10-year remove-and-replace warranty. Available from Value Vinyls in 14 vibrant colors in 3.25-meter and 6.5-meter widths. The new self-propelled Cherrington Model 5500 Screener offers the comfort of an air-conditioned cab with unparalleled maneuverability for quick and productive beach cleaning. The fixed screen oscillation thoroughly cleans the sand of all objects larger than the selected and easily changeable sifting screens, and immediately returns the clean, fluffy sand back to the beach. Screen out coral, stones, trash, seaweed, broken glass and cigarettes with the Model 5500. Shower Tower creates outdoor showers for beaches, parks, pools, waterparks, sand volleyball, with push-button, self-closing valves, non-corrosive, rust-proof tower, molded-in colors, and capable of serving multiple users at once with shower and/or footwashes. Handsome, vandal-resistant design. Easy surface-mount installation, Easy maintenance. EPIC AquaSports introduces The AirWave™ Inflatable Stand-Up Paddleboard. It is extremely rigid when inflated, but rolls up to fit in a shoulder bag when deflated. No roof rack or pickup is needed. The AirWave™ can be enjoyed on the water by all ages and skill levels. See package options on the Epic website. Airspace Solutions introduces the Aqua Challenge. Available in two sizes, the Aqua Challenge is a sealed unit that requires no continuous air supply, so is ideal for waterfront, marina or remote outdoor areas. The Aqua Challenge provides fun-filled play that will attract people and generate significant revenue. The EZ Launch system for Kayaks and Canoes is an industry-first Transfer System providing individuals with disabilities universal accessibility that meets ADA guidelines. The EZ Launch consists of a transfer bench with a slider board designed for two heights of wheelchairs and differing watercraft heights. Users can transfer from their wheelchair into watercraft while on the launch rather than the water, and launch/re-enter utilizing the handrails provided. Outdoor Shower Co. LLC manufactures quality stainless steel shower units available in freestanding and wall-mount designs. Their unique style adds character to any outdoor setting, and because of the quality of the materials and their lasting value, these showers give years of excellent performance and beauty. All stainless-steel products come with a 10-year warranty, even when installed in harsh outdoor environments.